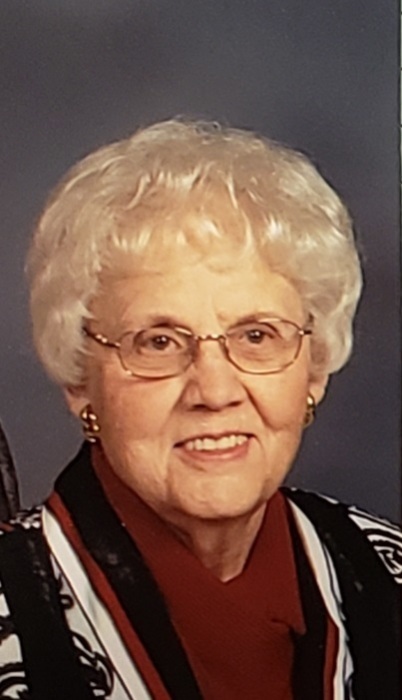 Charlotte Jacobs, age 91 of Hays, Kansas Passed away Friday, October 12, 2018 at the Good Samaritan Society, Hays. She was born April 2, 1927 in Victoria, Kansas to Mark and Sophia (Nowak) Weigel. She married Fred T. Jacobs in St. Joseph’s Catholic Church in Hays on November 12, 1945. He preceded her in death on February 4, 2009 after 63 years of marriage. She was in the retail clothing business for 15 years. After retirement she kept books for B & F Oil Company which was a family owned business. She was a member of Immaculate Heart of Mary Church, Daughters of Isabella #254 and the VFW Auxiliary 9076 all of Hays. Charlotte is survived by a son, Bob Jacobs and wife Nancy of Hays; two daughters, Dee Hand and husband Bill of Hays and Debbie Riedel and husband Gerald of WaKeeney; five grandchildren, Kory and Matt Jacobs, Dustin Hand and life partner Katie Wendell, Taylor and Colton Riedel; two great grandchildren, Jacob and Presley Hand; three brothers, Mark, Duane and Dennis Weigel and three sisters, Donna Meyers, Carrie Brungardt and Cheryl Engel. She was preceded in death by her parents, six brothers, Marvin as an infant, Don, Ken, Lee, Darrell and Bob Weigel and two sisters, Dolores Meis and JoAnn Weigel. Funeral services will be at 10:00 AM Tuesday, October 16, 2018 at Immaculate Heart of Mary Church in Hays. Fr. Fred Gatschet will officiate. Burial will follow services in St. Joseph’s Cemetery. Visitation will be on Monday 5:00 - 8:00 and Tuesday 9 AM – 9:30 AM all at Brock’s-Keithley Funeral Chapel and Crematory 2509 Vine Hays, KS 67601. A combined Daughters of Isabella and VFW Auxiliary rosary service will be 6:30 PM Monday followed by a parish vigil service at 7 PM all at the funeral chapel. Memorial contributions are suggested to Immaculate Heart of Mary Church or for Masses.